Welcome to the 2nd HALLOWEEN HUSTLE 5K! 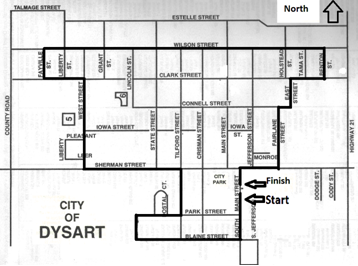 This race is a great flat, shaded course in the wonderful community of Dysart, Iowa. It starts and finishes at the Dysart Park. Come and compete against your friends, or just participate and have fun, either way you get a cool T-shirt and some exercise. All participants in the Run/Walk must be registered! All proceeds go to Union Post-Prom Activities. Medals will be given to the top 3 finishers in each division. Packets may be picked up on race day starting at 12:45 P.M.
All packets should be picked up by 1:45 P.M. There will be a separate table for those who have pre-registered. The course is flat, partially shaded and in town. Male course record is 15:56 held Brad Wrage. Female course record is 18:37 held by Jill Wagaman. A water station will be available halfway through the race. A post race refreshment party for all participants will also be held. When this page loaded, the official time was 8:48:40 AM EDT.